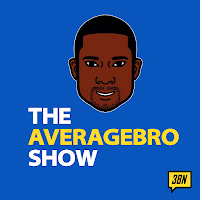 AverageBro: Ashy Or Classy?!? - Benjamin Bixby by Andre 3000. Ashy Or Classy?!? - Benjamin Bixby by Andre 3000. This may or may not surprise you guys, but I'm no slave to fashion. Yeah, I've got some nice duds in the closet, and I know how to do it up when me and Mrs. hit the town, but more often than now, I'm in bum-mode. I work in an office with less than a dozen people, and attend a church with a strict dress-down policy. 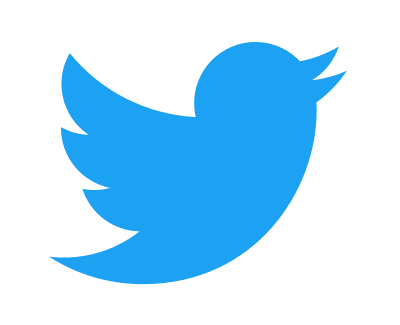 I don't know what any of that has to do with this post, but hey, I already typed it, soooo. I do own a pair of Rocawear jeans, as well as a pair of Sean Johns. Both are comfortable, fit well, and look nice. Also, both cost a grip, but I consider them well worth the money. Otherwise, I'm way past the key demo for "hip hop labels" and I know this. I'm 35, I have no need to dress like I'm half my age. Still, it seems like every year, whatever rapper's hot gets his own vanity clothing line. I say this is "vanity" because with few exceptions, the clothes are wholly manufactured by some no-name company in Malaysia, and the rapper is little more than a celebrity endorser of severely overpriced goods. The list of these fad lines too too lengthy to note here, but I remember Busta Rhyme's Bushi (who wants to dress like Bussa Buss? 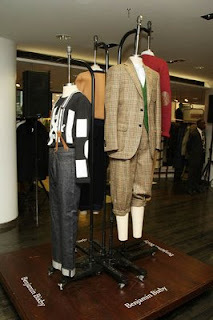 ), Nelly's Vokal (who wants to dress like that one St. Lunatic with the Jason Voorhees mask? ), Beanie Sigel's State Property (the jeans had a special pocket for your "work" and another for your "piece"), 50 Cent's G-Unit gear (for the studio-thug in all of us) and perhaps most regrettably, M.I.M.S.' This Is Why I'm No Longer Hot' line (wanna dress like a 13 minutes-of-famer?). I don't shop in the mall much, so I'm not even sure this stuff ever sells for the actual retail price in legitimate (ie: non-ghetto mall/swap meet knockoff) stores. In fact, the only time I ever really see any of these "lines" is when I occasionally stop by a discount retailer like Marshalls or TJ Maxx. Those stores are like a graveyard for these "urban clothing lines". I still see FUBU gear in there to this day. I guess it was For Us, By Us, and Abandoned By Us. It's also 50% off, so rack up. 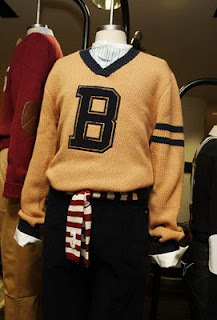 Thus, I wonder how long it'll be before Outkast's Andre 3000's Benjamin Bixby line ends up on the clearance rack, cause I just can't see nobody wanting to dress up like some ghetto Bagger Vance. 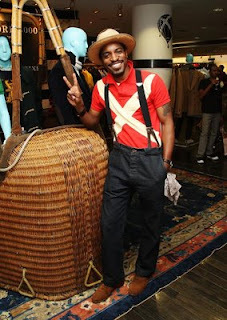 For those who fancy some haberdashery from Andre 3000's new fashion line, you'll have to either wait for some pieces to trickle down to eBay, or make reservations to fly across the pond. 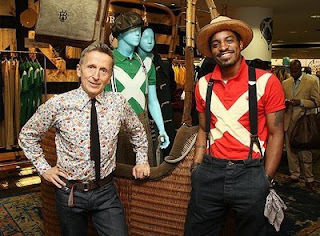 The Guardian is reporting that the Outkast rapper, born Andre Benjamin, is selling his new Benjamin Bixby line of classic menswear exclusively at Harrods in London. 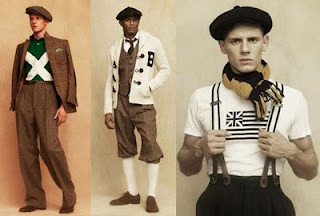 As previously reported, the line features 1930s baseball-inspired clothing, including tweeds, plus fours, pleat-fronted trousers, cardigans with bold lettering, flat caps and braces. The rap star says he sketched the entire line himself and has visited Italian clothing factories and textile fairs in Paris for inspiration. 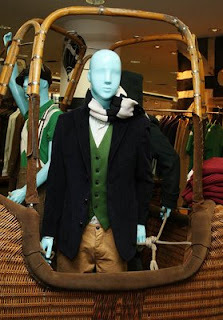 He also loves shopping at Hackett on London's Sloane Street, as well as Portobello market for vintage corduroys and brogues. And now, for the clothes themselves. Sheesus H. Christ, who would buy this crap!?! Seriously, this is some ole' prohibition era iddish!!! These clothes literally scream "I'm colored, and I know my place, Massa!" 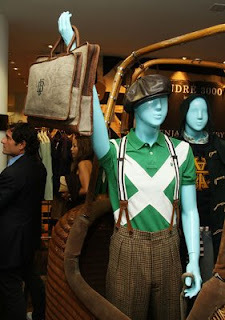 If you wanna dress like a lawn jockey, knock yourself out. Question: Would you buy/sport any Benjamin Bixby gear? What's the over/under on how long it takes this Caddyshack wardrobe to end up on the 50% off rack at Filene's?